The Tribes: Ascend open beta goes live on February 24. 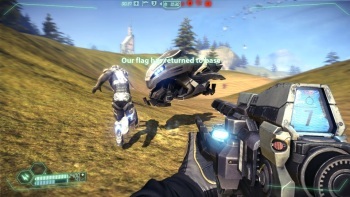 Tribes: Ascend is a revival of the classic online multiplayer shooter Tribes, being put together by the gang at Hi-Rez Studios. It was announced about a year ago, morphed into a free-to-play PC exclusive and was then pushed back into 2012, it being 2011 at the time. But now, finally, it's ready to show a little skin by way of an open beta that begins in just a couple of days. "Over 300,000 players participated in the closed beta and the game has improved greatly based on community feedback," said Hi-Rez COO Todd Harris. "We have expanded capacity in North America, Europe, and Australia and added new local servers to support growing communities in Brazil and Asia." A major patch will lead into the open beta, adding a new Arena Deathmatch mode with two maps, new CTF and Team Deathmatch maps, new Soldier unlockables, new default suits for the Doombringer and Brute and of course a whole pile of bug fixes and tweaks. And in another spot of good news, Hi-Rez said there will be no players wipes - all progress and unlocks will be preserved in the open beta. No firm date for a full launch has been set, but Tribes: Ascend is currently expected to go live later this year. To learn more or get in on the action, check out tribesascend.com.